Many years ago in Florence I discovered cavolo nero. It started when a good friend of mine took me to one of her favorite little places to eat ” Il Ristorante Cavolo Nero” on Via Guelfa , translation black cabbage. For many years cavolo nero was not readily available in the United States. Today, with kale coming into it’s own as one of the healthiest foods, it’s possible to find. Here in the U.S. it goes by many names such as tuscan or black or dinosaur or lacinato kale. 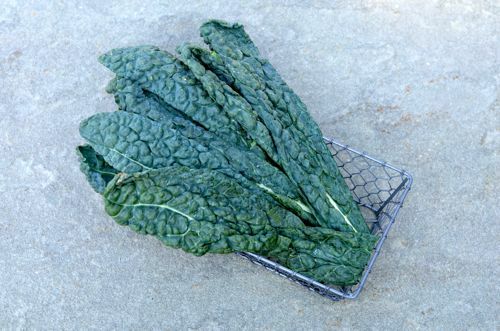 The leaves are a dark blue green and are sweeter and more delicate then other varieties of kale. When the leaves are blanched they become a beautiful vibrant green which makes a wonderful pesto. 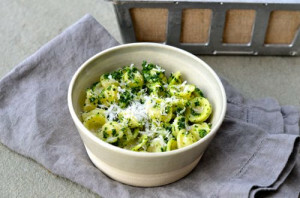 The pesto can be used as a crostini – topping grilled bread with a littel creamy ricotta cheese , some pesto and a little freshly grated parmigiano cheese or as a delicious and easy pasta dish. 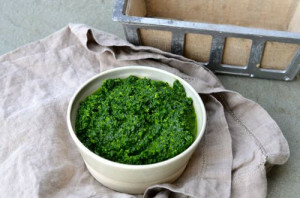 You’ll definitely enjoy the pure simplicity of this pesto as well as the bright color and flavor!From by the bay, wishing you cavolo nero food memories! Bring a pot of salted water to a boil. Add cavolo nero and garlic; cook until bright green, 3–4 minutes. Remove from heat and drain. Place the cavolo nero and garlic in a food processor; pulse to a purée. Pour in the oil while pulsing to form a pesto; transfer to a large bowl and mix in the sea salt. Bring a pot of salted water to a boil; add orecchiette and cook according to package directions. Drain the pasta and add to bowl of pesto. Fold in parmigiano-reggiano and pecorino and salt and pepper. Serve immediately. This entry was posted in Pasta, recipes and tagged black kale recipes, cavolo nero recipes, Florence Italy, italian food, italian recipes, kale recipes, pesto recipes, tuscan kale recipes on March 27, 2014 by entertainingbythebay. 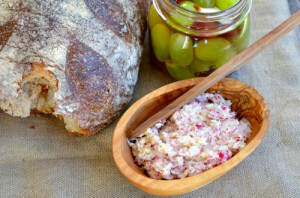 Inspired by a dish I recently enjoyed out, here is an easy little nibble to serve with your favorite wine, cocktail or beverage. You simply cut up and saute some chorizo and while your chorizo is cooking, add a few ingredients into a saucepan and reduce into a deep, rich ,sweet and sour sauce to pour over your chorizo bites and serve. Fragrant, spicy , salty , sweet and sour, you are bound to enjoy! From by the bay wishing you sweet and sour food memories! In a large sauté pan, heat the olive oil over medium high heat for about 1 minute. Cook the chorizo and garlic for 2-3 minutes, turning the sausage once during cooking. 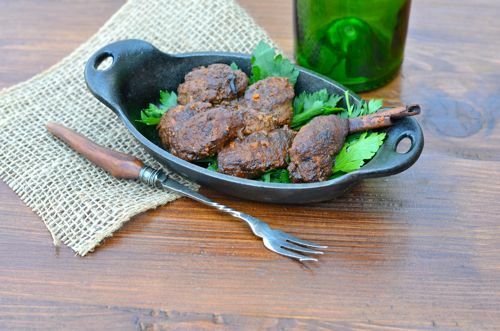 Set sausage aside in a serving dish. Place in a medium saucepan the vinegars, brown sugar, water, cinnamon and cloves. Bring to a simmer over medium heat and cook for about 10 minutes reducing liquid to half. Cover the chorizo with the hot liquid and serve. This entry was posted in appetizer, recipes and tagged chorizo recipes, cocktail party recipes, sweet and sour recipes on March 20, 2014 by entertainingbythebay. Enjoy Updates at Entertaining By The Bay! This entry was posted in Uncategorized on March 18, 2014 by entertainingbythebay. 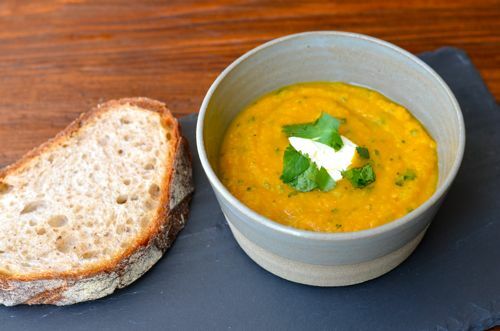 This aromatic, velvety, orange colored soup is a perfectly satisfying lunch or dinner along with your favorite salad or it could be a great starter to a special meal. Either way, you’ll want to try this flavorful soup made with sweet potatoes, carrots and red lentils. Not only is this soup delicious it’s packed with vitamins such as A, B and C. How good is that?From by the bay, wishing you aromatic food memories! In a stock pot add all ingredients except cilantro and lime. Bring to a boil , reduce heat to simmer and cover. Simmer until the potatoes and lentils are cooked about 20 to 30 minutes. Let cool, then puree in a food processor with the juice of the lime and 1/2 cup chopped cilantro. Adjust salt and pepper to taste. Reheat to serve . Add a teaspoon of creme fraiche and a few cilantro leaves as garnish and serve. *Note : I suggest vegetable stock , but you can also use chicken stock. This entry was posted in recipes, soups and tagged cilantro recipes, creme fraiche recipes, lentil recipes, lime recipes, soup recipes, sweet potato recipes, winter foods, winter recipes on March 13, 2014 by entertainingbythebay. So it’s Sunday afternoon by the bay and we are anticipating yet another snow storm. Enough already!! I’m wistfully thinking of Spring. One of the vegetables I look forward to in spring is the radish. I love the crisp, fresh and spicy taste of this bright red root. I found this terrific radish recipe from the Lee Brothers. Matt Lee and Ted Lee are founders of “The Lee Bros. Boiled Peanuts Catalogue,” a mail-order catalog for southern pantry staples who co-authored The Lee Bros. Southern Cookbook and Simple Fresh Southern, which is a must have cookbook for your library. This is their recipe for radish butter which I’m sharing below. Happy Eating! 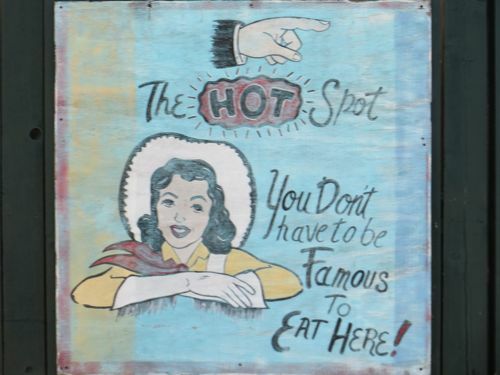 From by the bay, wishing you some crispy and fresh food memories! 1. Put the radishes in the bowl of a food processor and pulse until the radish is chopped into very fine dice, four or five 3-second pulses. 2. Transfer the contents to a length of cheesecloth or a double thickness of paper towels and wring out the excess liquid. 3. Transfer to a medium bowl and add 4 tablespoons of the butter. 4. 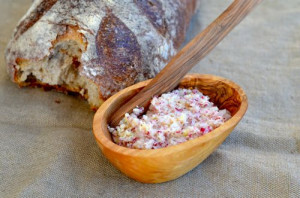 With a rubber spatula, cream the radish and butter together, adding more butter 1 tablespoon at a time, until the mixture comes together in a smooth, pliable mass. 5. Transfer the mixture to a 2-cup ramekin or bowl, sprinkle the salt and pepper over the top, and serve immediately. (The butter will keep, covered with plastic wrap, in the refrigerator for up to 2 days. 6. Remove it from the refrigerator 15 minutes before serving to let it soften. Sprinkle the salt and freshly ground pepper over the radish butter before serving). Matt Lee is co-founder of “The Lee Bros. Boiled Peanuts Catalogue,” a mail-order catalog for southern pantry staples. He is also a food and travel journalist whose work has appeared in Travel + Leisure, Food & Wine, GQ, The New York Times and Martha Stewart Living. He is co-author of The Lee Bros. Southern Cookbook and Simple Fresh Southern. Ted Lee is co-founder of “The Lee Bros. Boiled Peanuts Catalogue,” a mail-order catalog for southern pantry staples. He is also a food and travel journalist whose work has appeared in Travel + Leisure, Food & Wine, GQ, The New York Times and Martha Stewart Living. He is co-author of The Lee Bros. Southern Cookbook and Simple Fresh Southern. This entry was posted in appetizer, recipes and tagged butter recipes, cocktail party recipes, Lee Brothers, Nashville, radish recipes, sea salt recipes, spring foods, spring recipes on March 6, 2014 by entertainingbythebay. Check out the newest issue from Mermaids of the Lake, including my feature on Nashville and biscuit making! This entry was posted in Mermaids of the Lake and tagged biscuit recipes, jam recipes on March 4, 2014 by entertainingbythebay.